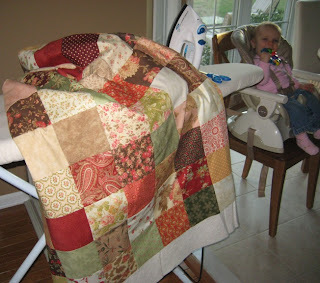 Last time we were at my family's cabin in North Carolina it was chilly in the mornings and I thought a lap quilt would be a great addition to the place. And the week after we got back Kerry posted about this stacked coin quilt for her son, and she graciously sent me the specs for cutting pieces. So I roped in my mom and sister-in-law to share the load. Mom cut out the million pieces and we each sewed together a couple rows of "coins." And then I arranged & sewed together the rows and then bound the edges à la Heather Bailey. (Love her.) I stitched-in-the-ditch for the actual quilting instead of tackling Kerry's beautiful stippling job. Why? Because I wanted to actually finish the project. Case in point: My next quilt. I got finished with the cabin quilt and was like, "Now I want one," so during the rain/wind at the beach I selected Moda charm packs (5" squares, each one different, collections include Frosted Memories, Aster Manor, Glace, & Mill House Inn). Instead of creating loooong rows of squares to start (and doing the necessary math), I sewed together random pairs of squares. Then I sewed those to other pairs (1x4) then sewed those to other strips of 4 to make 9 blocks of 16, and by sheer luck it ended up using all the squares and was lap-quilt size (55"). (Someone please give me a sticker!) Then, since I prefer "aesthetically pleasing" to "truly random," I turned the blocks this way and that until each of them looked good with its neighbors. Sewed those together, bought batting, bought edging. The end. There it sits on the ironing board, prominently displayed in our living room for weeks. I just need to buy fabric for the back, fabric that is worthy of the back, and by this I mean I have turned into somewhat of a fabric snob. Once you have sewn together Moda (and other designer) quilt cotton, the stuff at JoAnn Fabrics feels like cheesecloth in comparison. So, in this capitalistic society, Google is helping me find the best price on a tonal red I chose from the Glace pack, so hopefully I will finish soon. And, in reference to the post title, I couldn't care less which way my seams are pressed or if my corners match up, which makes me an irreverant quilter. 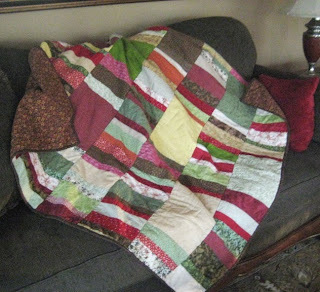 I just want a lap quilt that looks pretty from more than two feet away.